In the last few years, genetic data massive treatment has become a common practice in the field of the prevention of diseases with inherited risk factors. 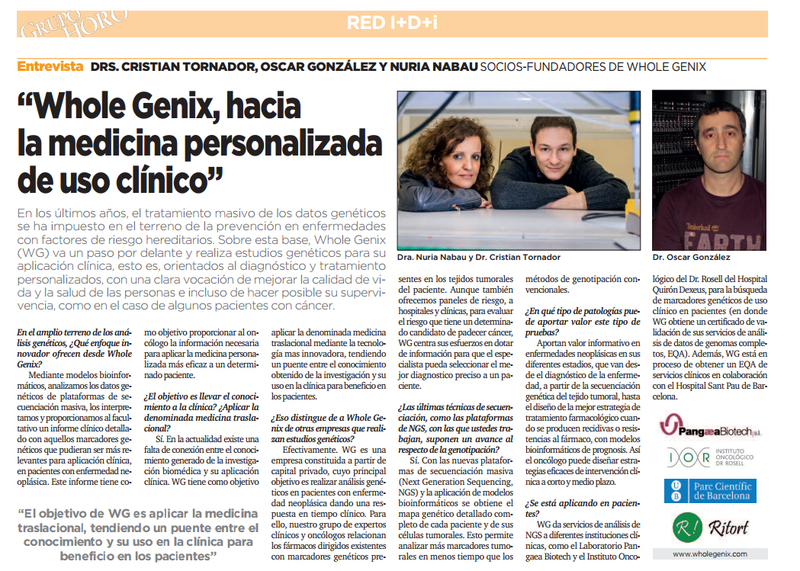 On this basis, Whole Genix (WG) goes one step further and performs genetic studies for clinical application, focused on personalized diagnosis and treatment, with a true vocation for the improvement of people’s health and quality of life and even enabling survival, as in the case of patients with cancer. In the wide field of genetic analyses, which innovative approach does Whole Genix offer? By means of bioinformatics models, we analyses the genetic data of massive sequencing platforms, we interpret it and deliver a clinical report to the medical practitioner, detailed with the genetic markers which could be relevant for the clinical application in patients with neoplastic disease. This report aims at providing the oncologist with the information necessary for the application of a more effective medicine to a given patient. Is the goal to conduct knowledge to clinical medicine? Does it aim at applying the so-called “translational medicine”? Yes, of course. Nowadays, a lack of connection exists between the knowledge generated by biomedical research and its clinical application. WG aims at applying the so-called “translational medicine” by means of the most innovative technology, building a bridge between the knowledge obtained from research and its clinical use for the patients’ benefit. Does this distinguish Whole Genix from other companies that perform genetic studies? Yes, it does. Whole Genix is a company founded by private capital, and its main goal is to perform genetic analyses in patients with neoplastic diseases, giving a response in clinical time. To this end, our team of clinical experts and oncologists relate the existing drugs with genetic markers which exist in the patient’s cancer tissue. Although we also offer risk panels to hospitals and clinics to evaluate the risk a given candidate presents of suffering cancer, WG invests its efforts on equipping the medical specialist with information, helping him select the best precise diagnosis of a patient. Do the latest sequencing techniques, such as the NGS platforms, with which you work, involve an important advance regarding genotyping? Yes, they do. With the help of new massive sequencing platforms (Next Generation Sequencing, NGS) and the application of bioinformatics models, we obtain a precise and complete map of each patient and his tumor cells. All this enables us to analyse more tumor markers in less time than it takes using conventional genotyping models. In which pathologies can this type of tests add value? These tests provide information value on neoplastic diseases at its different stages, which goes from the disease diagnosis and the genetic sequencing of the cancer tissue to the design of the best pharmaceutical treatment strategy when recurrences or drug resistance occur with prognostic bioinformatics models. That way, the oncologist can design effective strategies of clinical intervention in the short medium term. Is it currently applied to patients? WG gives NGS analysis services to different clinical institutions, such as the laboratory Pangaea Biotech S.L and the Institut Català d’Oncologia of Dr. Rosell of the Hospital Quirón Dexeus, for the genetic markers research of clinical use in patients (in which WG has an EQA validation certificate for its whole-genome data analysis services). Furthermore, WG is in the process of obtaining an EQA certification for its clinical services, in collaboration with the Hospital Sant Pau de Barcelona.